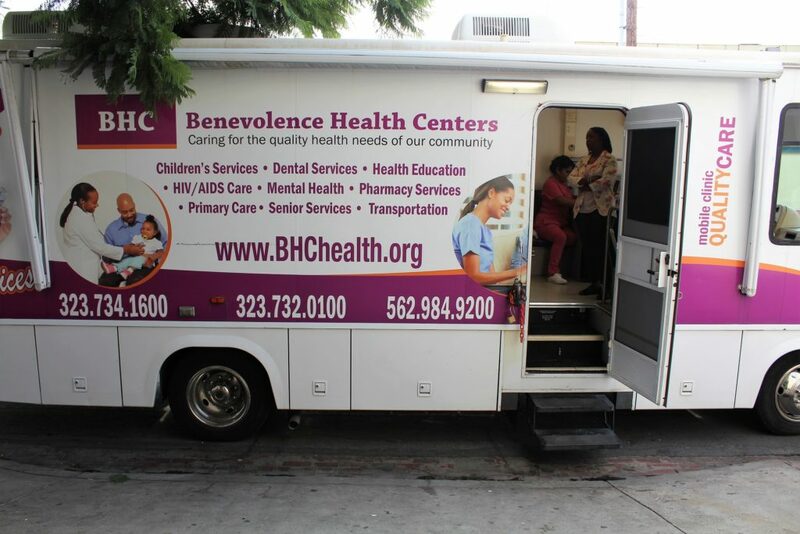 Benevolence Health Centers’ mobile clinic has been coming every Tuesday from 9 a.m. to noon since last November. We originally connected with them through our partner Lava Mae. They have been providing general health care, shots, and TB testing for about 15 of our guests each week. They’ll also be providing specialized clinics every two months that include podiatry and dental care. Over 1/4 of the population we serve in Metropolitan LA has no medical insurance and 23.1% has no source of care in place according to Kaiser Permanente’s 2016 Community Health Needs Assessment. BHC’s mobile health clinic is a key part of our Health & Hygiene services at SFC that include our shower program. SFC’s Health & Hygiene Services not only provide direct access to health care through regular, on site access to our health clinic partners, but our center also creates a bridge of support that increases accessibility to these critical services for our populations. These guests face additional challenges that create barriers to accessing proper health care that include lack of transportation, language barriers, income, compounded health issues, and lack of knowledge. Our comprehensive program offerings provide improved recognition and attention to health issues specifically through intake for our resource services and case management. Donate directly to support our Health & Hygiene Services!